Major conventions are expected to draw more than 15,000 visitors to Cincinnati. (CINCINNATI, OH - JUNE 20, 2018) - This week marks the start of a summer filled with high-profile conventions in Cincinnati, beginning with the Sigma Pi Phi Grand Boulé, June 22-26. The Grand Boulé will draw more than 1,200 visitors to Cincinnati with an anticipated $1.15 million spent by attendees. Major conventions throughout the summer are expected to bring more than 15,000 attendees and generate more than $8 million in visitor spending overall. The Grand Boulé is the annual gathering for Sigma Pi Phi fraternity, the oldest African American Greek-lettered organization. The fraternity, known as the Boulé, has more than 5,000 members, and has included notable members like Martin Luther King Jr., W.E.B. Du Bois and Arthur Ashe. The 54th Grand Boulé in Cincinnati will welcome prominent figures like U.S. Senator Cory Booker, TV chef Carla Hall, Cincinnati native Bootsy Collins and more. 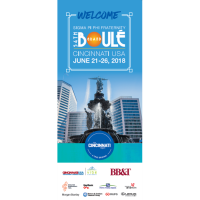 Events for the Grand Boulé will primarily be held at the Duke Energy Convention Center, with other programming opportunities at various venues such as Paul Brown Stadium, the Belle of Cincinnati riverboat, the National Underground Railroad Freedom Center and various downtown hotels. Vibe Cincinnati, an initiative of the Cincinnati USA CVB, will host various free activations and experiences on Fountain Square this week in conjunction with the Sigma Pi Phi Grand Boulé. Vibe Cincinnati is the CVB’s multicultural platform, which connects locals and visitors to Cincinnati’s mix of cultures through performances, local art and retail vendors and immersive multicultural experiences. Grammy-nominated Carl Thomas is among the performers scheduled to participate in Vibe’s programming this week. A complete schedule of Vibe events can be found here.